According to the Russian Ministry of Defense, NATO countries have been stepping up air activity near Russia's borders since mid-June 2017. Speaking to Radio Sputnik, military expert Viktor Baranets said that the bloc is increasing pressure on Russian frontiers and explained why it helps the Russian Aerospace Forces keep in good shape. NATO has stepped up air activity near Russia's borders, military expert Viktor Baranets told Radio Sputnik, adding that the bloc is apparently seeking to increase pressure on the country's frontiers. 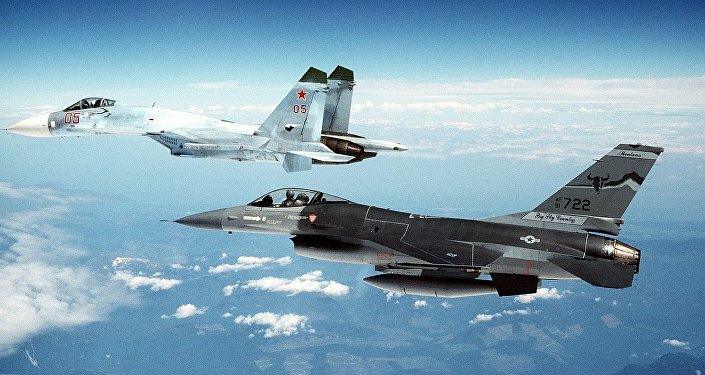 According to the official site of the Russian Ministry of Defense, over the past weak Russian fighter jets have taken off four times to intercept NATO aircraft. The ministry's infographics show that nine of the bloc's planes were conducting reconnaissance along Russian borders. It is noted that none of them violated the airspace of the country. Last week, the Ministry of Defense reported that six flights were carried out by Russian warplanes to intercept NATO reconnaissance aircraft. For their part, foreign planes conducted 15 reconnaissance flights in close proximity to Russian borders. In mid-June NATO countries sharply increased their air activity on the western borders of Russia. The most notable episode took place over the neutral waters of the Baltic Sea on June 21 when the bloc's F-16 fighter made an attempt to approach a flight carrying Russian Defense Minister Sergei Shoigu heading to Kaliningrad. 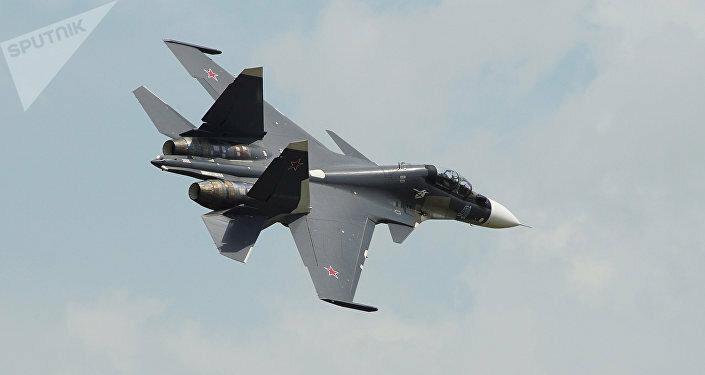 However, the NATO warplane was immediately chased away by a Russian Sukhoi Su-27 fighter jet. It was earlier reported that from June 12 to 18 Russian jet fighters conducted 14 intercepts of foreign reconnaissance planes while a total of 23 reconnaissance flights were performed near the Russian border. According to the official newspaper of the Russian Defense Ministry "Krasnaya Zvezda" these spy activities involved 10 flights by US aircraft, including the RC-135 and the Global Hawk strategic drone. Four flights were conducted by the Norwegian air force on an R-3C Orion reconnaissance plane. Swedish aviation conducted three flights. Britain and France performed two reconnaissance flights each. Commenting on the matter, Konstantin Sivkov, a Russian military analyst and president of the Academy for Geopolitical Problems, highlighted that "the number is unprecedented"
"The number is unprecedented, especially taking into account the fact that there is no Cold War today. At that time, we saw an average of seven-eight intercepts a week. But today the number is much higher," Sivkov told Sputnik in late June. Judging from recent developments, it appears that NATO is not inclined to reduce the number of flights near Russia's borders. As the military observer of the newspaper Komsomolskaya Pravda, retired Colonel Viktor Baranets said in an interview with Radio Sputnik reports, NATO planes appear on Russian borders several times a day. "The Ministry of Defense has recently made numerous statements about the increasing air activity of NATO aircraft, especially in the western and north-western strategic areas. The statistics show that reconnaissance planes and long-range radar detectors of NATO member states appear at Russian borders about two or three times per day. Such 'air pressure' on our frontiers evokes strong memories of 1941," Baranets underscored, referring to the beginning of Nazi Germany's invasion of Russia. "But let's think that it's just a sad analogy," he remarked, adding that NATO aircraft have never crossed the Russian border line. "However, in general, this air activity is a reflection of NATO's very unfriendly attitude towards the Russian Federation," Baranets said. Still, according to the military analyst, every cloud has a silver lining and the bloc's increased activity helps the Russian Aerospace Forces' remain agile and increases its combat readiness. "Although it may sound paradoxical, this air activity of NATO brings benefit to our Aerospace Forces: it helps our active duty forces keep in good shape," he pointed out. At the same time, he admitted, intercept flights cost money. According to Baranets, one hour of the Su-27 flight costs $10 thousand. As for the US F-22, one hour of its flight costs American taxpayers $40 thousand, the military expert remarked.